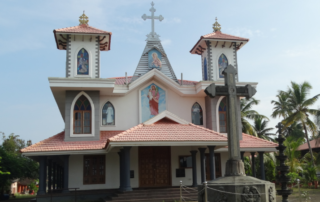 St. Joseph church, Kandamkary is a small parish under the Archdiocese of Changanassery. 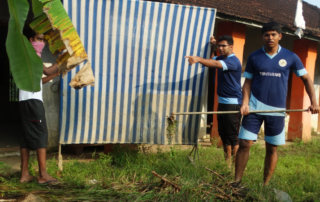 This particular place is part of Kuttanad, which was deeply affected by the flood. 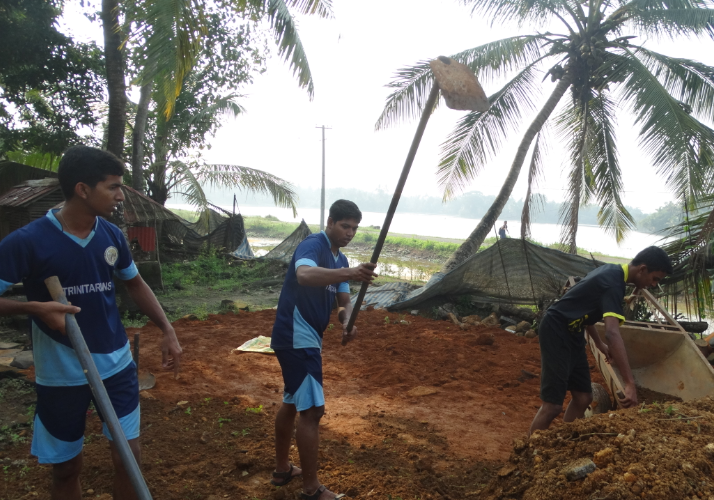 Main occupations of the parishioners are farming, daily wage work and fishing. Paddy is cultivated thrice a year. 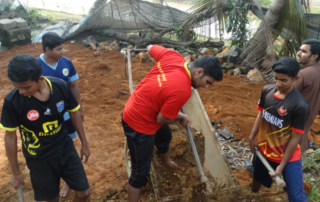 But due to the unexpected flood, the paddy fields have been wiped away. But the people of the locality are reluctant to begin the next cultivation as they are unsure of the changing climatical conditions. 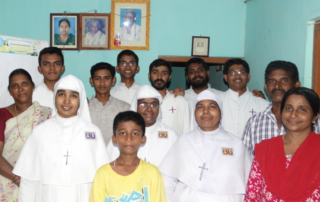 The brothers of the Holy Trinity Ashram, Bangalore, decided to go to this particular place to have their Trinitarian Liberation Mission in connection with the relief work. 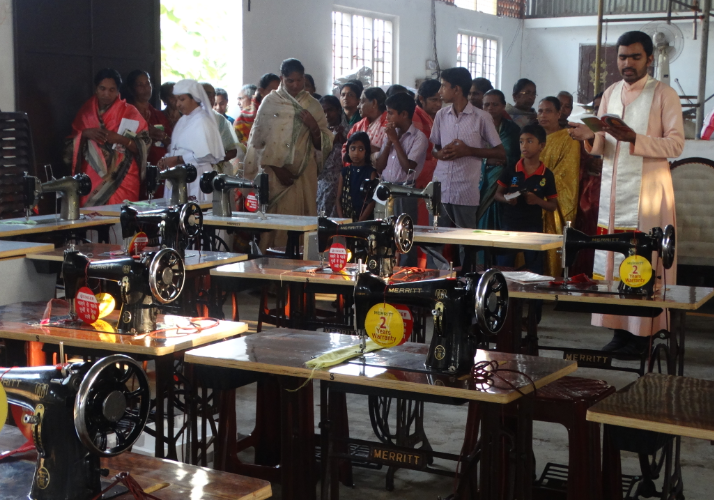 The parish of Kandamkary consists of 153 families. Rev. Fr. Rajeev Palackasserry is the present parish priest who is very kind, understanding and much loved about pastor. There are four priests from the parish and 16 religious. This parish began in the year 1927. All the families of the parish were affected by the flood and everyone had to evacuate themselves to safest zones. 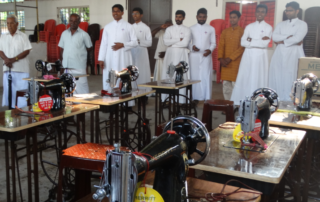 We, the brothers of Holy Trinity Ashram, Bangalore, reached in Kandamkary on October 22, Monday. There were 7 units in the parish. We were requested to visit all the families which had been suffering from various psychological traumas or downcast feeling hopeless and helpless. Therefore our primary aim was to create an ambience of confidence, esteem, and love. 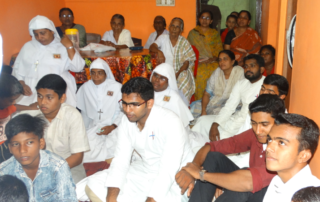 We visited all the families and spent ample time in listening to their woes and anxieties. They shared openly their difficulties and adversities they had gone through during the devastating flood. A vast majority of people live under fear of facing calamities of the same nature in the coming future. 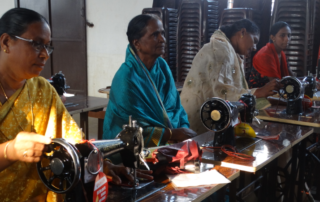 We helped them to express themselves openly and courageously. We tried to make them understand God’s providence in the safety of their families and dear ones and exhorted them to seek divine assistance for the continued protection. 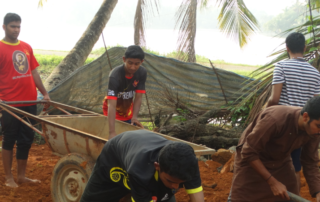 Every day after the Holy Eucharist we had some manual work like cleaning the parish surroundings and filling the land with soil to avoid water being accumulated on the way side. Soon after breakfast we would visit families up to 7 p.m. We gathered all the families we visited during the day in one particular family and led them in their traditional evening prayers, bible reading and gave some reflections. Our friars took turn to animate the prayer sections daily and many got the opportunity to share the word of God which was of much comfort to them. The prayer section was followed by the cultural programmes which were animated by our brothers. We used this occasion to relate common exhortations and announcements. Many came forward to put their talents out in spite of their age, and conditions of health. This made them forget their anxieties and agonies at least for a while. We made use of this time also to speak about our Order and its mission to the people. Some students expressed their desire to join us, and the parish priest was very open and encouraged the students to pray and contemplate on their vocation for the future in the Order. After returning from the houses we would freshen up ourselves and took time to evaluate the day’s ministry. The parish priest encouraged us on and assisted us with his expertise. 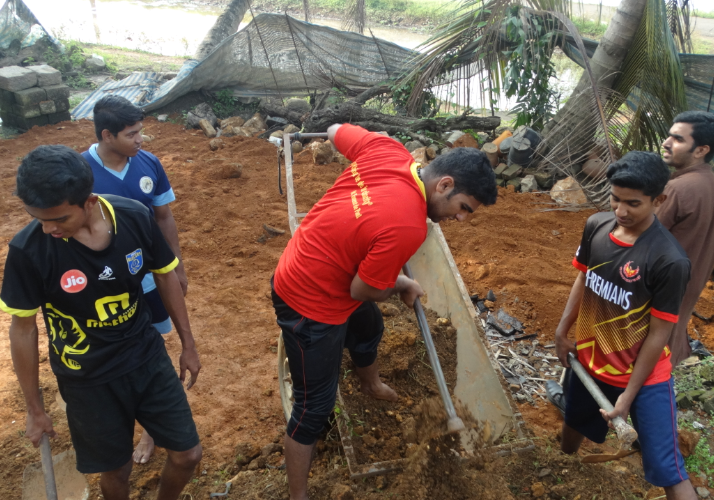 Occasionally after getting back to the presbytery we continued with our filling the church compound with sand. One day we proceeded to the Bishop’s House to meet the Bishops and helped them to sort out the food packages which were to be distributed for the flood victims. 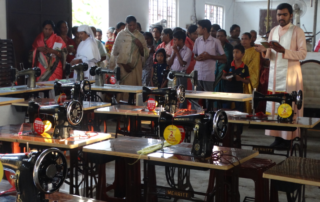 We also purchased fifteen sewing machines which could help the women to earn some money as a way of self help. We also listed out the families which needed help and financial support. 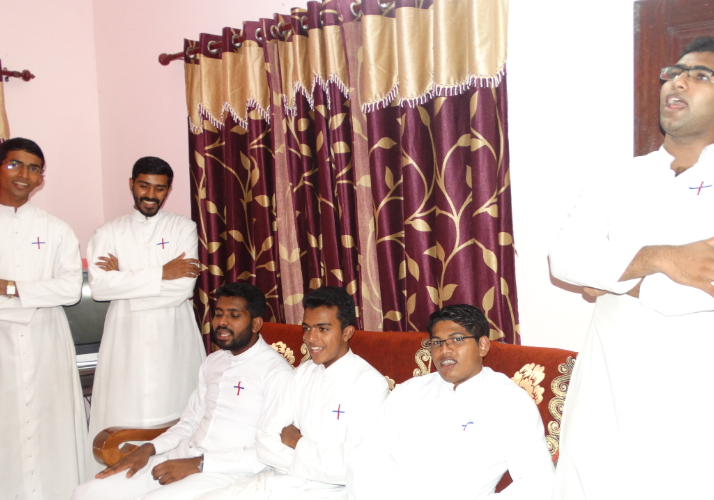 We had really beautiful days of ministry in Kandamkary Parish. We felt our presence more vibrant and active among the people. When we began to love their culture, by adjusting with the limited facilities, they showed great amount of love and concern. We were really taken up by the love of the people. Their faith was really moving and touching. They shattered our preconceived ideas about the laity in this changing world. We realized that we can do a lot for the people, and they are really waiting for right leadership and guidance. It would be ideal to continue our mission exposure to Kandamkary, as it can help us to get in touch with the misery and brokenness of the people. It can also be a help in our future ministry as priests. The contact with such a parish of simple and faith living people can also help the Order to have vocations which are sound and solid.